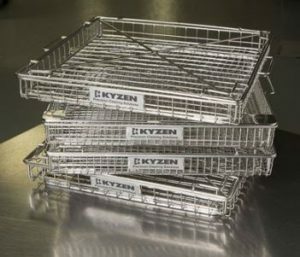 Enhance your Cleaning Process with specialized KYZEN Cleaning Accessories. From Wash Baskets to Wash Curtains to Spill Trays and more, we make finding and purchasing the accessories you need for effective cleaning easy. Today, many small parts are processed in baskets or special fixtures to protect them during the cleaning process. However, many basket designs use stamped steel and internal mesh that greatly restrict cleaning agent flow and impingement energy. Reducing your environmental footprint during the cleaning process is exactly what we had in mind when developing KAPTURE. This environmentally friendly recycling system separates soils from the solvent during the degreasing cleaning process. KYZEN’s HE53 MOISTURE ANALYZER provides fast NVR results in an easy 3-step process. The HE53 Moisture Analyzer comes with everything required to achieve accurate and repeatable weights.